In today’s turbulent financial times, it is commonplace to hear ads on the radio or television advertising gold that is available for investing as a safe harbor against inflation. In an economic free market, the more that gold costs per ounce in currency, the less the valuable the currency is worth. With this in mind, many consider gold to be a stable investment no matter what the economy. Unfortunately for investors, the Bible teaches that gold is no safe harbor when it comes to economic security. Likewise, Biblical teaching on gold goes much farther than just the idea of gold being a precious metal. With this in mind, we will look at what does the color gold represent in the Bible. The answer to this question may seem obvious. It is a precious metal that has fascinated people since the beginning of time. In chemistry it is represented by the symbol “Au” from the Latin word Aurum and many have tried to use chemistry to change lead into gold without success. In Greek mythology, a story of King Midas who had the ability to turn everything he touched to gold gave rise to the phrase, “The Midas Touch,” used to describe someone who has a gift for making money as well as the byline of an auto repair chain that allegedly restores your vehicle to perfect condition with just a touch by one of its mechanics. The list is quite extensive of the many other aspects of how gold and the color gold is used to represent many things. 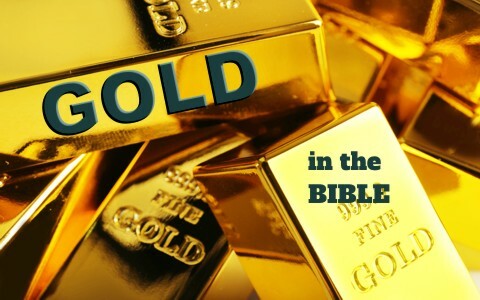 In addition to the obvious, the Bible uses gold to represent many things. Of particular note is the use of gold to pave the streets of heaven as follows: “And the twelve gates were twelve pearls; every several gate was of one pearl: and the street of the city was pure gold, as it were transparent glass” (Revelation 21:21). The interesting thing about this passage is the description of it looking like transparent glass. Many years ago I spent a year in Korea while serving in the U.S. Army. I went to a jeweler one day to have something made in gold. The Jeweler took large heavy scissors and cut a chunk of gold about an inch square from a small sheet of gold. He placed the gold in a clamshell and fired up a small torch and aimed it at the gold. It was not long before the gold melted into a liquid. As it did, it began to glow and appear somewhat transparent. As he continued to heat it, the dross (impurities) was burned off and would flew away as sparks. When it reached a certain point, he turned off the torch and the glow faded until it was back to the gold color of the original and shaped like a small pebble. Gold is a metal that has economic and metallic value. The physical properties of gold are unique to an extent that man uses the idea of gold to represent many things. Likewise, God uses gold in the Bible as a representation of many concepts and truths. Gold has no eternal value. Here is another Bible study for you: What is Sanctification? I was searching as to the significance of what colours meant in the bible. I found this site to be most useful.